XAMK (South-Eastern Finland University of Applied Sciences) is a university of welfare, technology and creative economics with educational institutions in Kotka, Kouvola, Mikkeli, and Savonlinna. XAMK acquired from Mevea the world’s first skimmer simulator manufactured for training purposes to extend its oil spill training to emergency response personnel. Training sessions are held at Kotka Maritime Center. “Oil spill training has previously focused on emergency procedures, such as booming the surroundings of the incident scene. Training of the actual clean-up has not been provided. 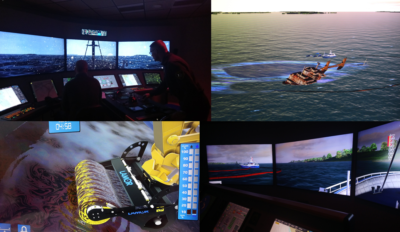 With Mevea’s simulator, we can also teach oil recovery skills for rescue personnel. 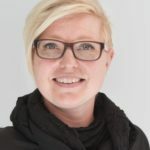 Additionally, the skimmer simulator helps to understand the requirements for waste logistics that is important to take into account as part of a recovery operation,” says Emmi Rantavuo, project manager at XAMK’s SCAROIL project. Training for the oil spill response skills in real-life conditions would be expensive, and the facilities for it would be difficult to organize. With the simulator, recovery activities can be practiced easily and safely, without damaging the environment. “The simulator can create a variety of weather and tidal conditions as well as action scenarios, and repeat the exercises several times. 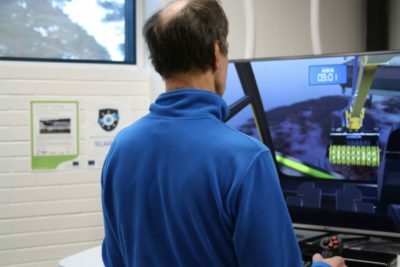 Our simulator models events in real time: it reacts to the user’s behaviour as something happens, so even minor changes are noticeable during the exercise,” concludes Mevea’s project director, Vesa Ahola. In oil spill response simulation, oil is collected with a brush wheel skimmer to a bucket from which it is pumped into a waste container. The simulator shows the trainee the proportion of skimmed oil and water. The exercise ends when the waste container is full. The task of the trainee is to learn how to handle the skimmer and to operate it in the optimum position in order to recover as much oil as possible. “If the skimmer is too deep in the water or at an incorrect angle to its surface, it collects more water than oil. When operated properly, water will only accumulate by about 5-7%, whereas in the worst case the container can be filled up to 50% with water,” Ahola explains. A Digital Twin of Lamor’s skimmer was created for the simulator by using 3D models, exact measurements and other technical information. In addition, Lamor provided real control equipment and units so that the simulator can be operated as the real skimmer. Mevea created a virtual model of the machine and the operating environment that is as close as possible to the real world. The final simulator was manufactured on the basis of the collected data and piloting in cooperation between XAMK and Lamor. “We created a mechanical simulation model of the machine based on physics and mathematical modelling. In addition, we created a visual process model that simulates the interaction between the environment and the machine: how the oil moves from the water surface to the skimmer and from there to the tank. We developed models to act together as they would also in nature. They follow the physical laws of real life, thanks to which the simulator feels realistic when used,” Ahola explains. The simulator built by Mevea for XAMK is the world’s first and the only known oil skimmer simulator used in oil spill training. In addition to booming and oil skimming, training days involve observation exercises as well as practice in the Incident Control Centre operation and teamwork. “Using a skimmer simulator, we get closer to modelling the entire oil spill response process. Now trainees will have access to the resource needs of both staff and logistics throughout the response operation,” Rantavuo continued. 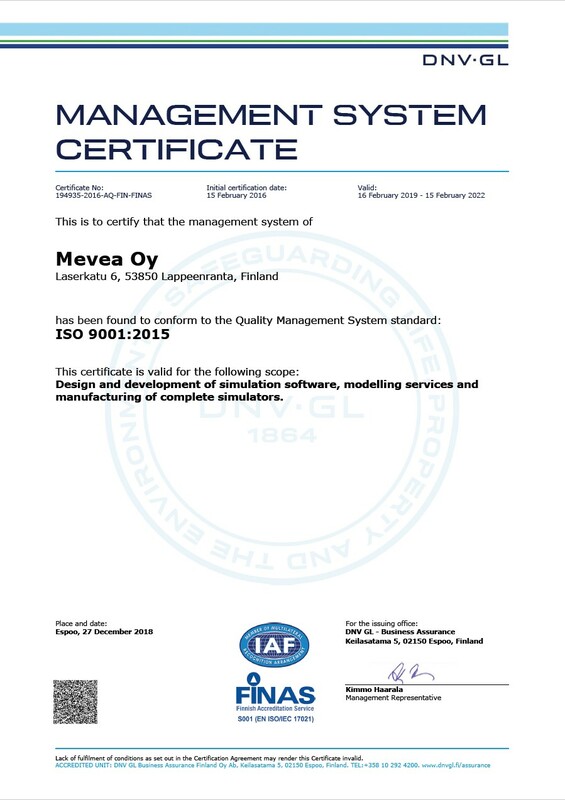 “Mevea is a good partner because they have a long experience of simulation. 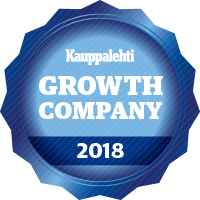 It is needed when doing something that has not been done before,” Rantavuo summarized. She is happy with the implementation of the simulator. “According to user feedback, the simulator feels realistic. It teaches very clearly in what position the bucket must be in order to make the skimming more efficient. 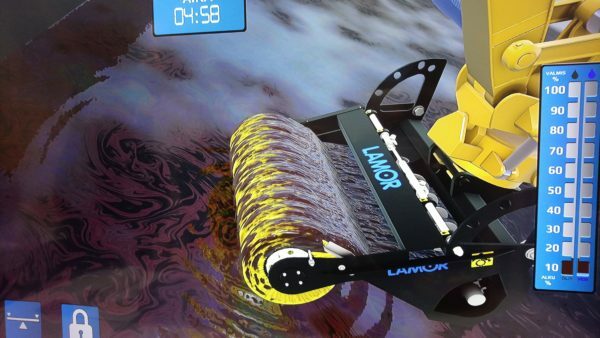 In the future, we can add for example different types of oil into the simulation programme, train people to skim oil from ice and slush, or even build a motion platform that simulates oil skimming when working onboard a rocking ship,” says Rantavuo. Mevea is a good partner because they have a long experience of simulation. It is needed when doing something that has not been done before.